addressing invitations, originally uploaded by julochka. 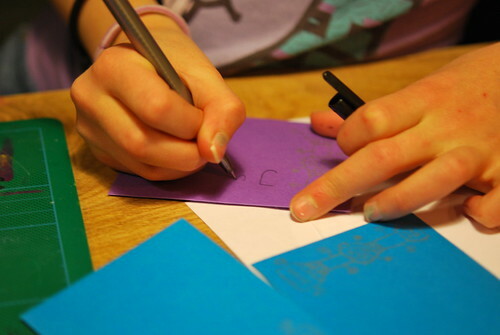 we spent a number of hours today making invitations for sabin's upcoming birthday party. we started last evening, drawing robots. because we're all about the robots at the moment. then, we made the screens and printed the little robots on some beautiful bright cards i bought at the fabulous norway designs last month. we made sweet robots with cupcakes on their tummies. sabin was so excited and so happy and so bubbly. she was making lists of the names of her classmates so she could write them on the envelopes, where we had gocco printed a little stack o'robots. it was fun and i hope it's the kind of activity that sabin will remember when she grows up. but, i have to admit that eventually, all of the chatter was driving me completely crazy. she counted and counted again, she named all 20 classmates and then named them again. she talked about which ones would give her what for a present. she never, ever stopped talking. or wiggling. jumping up and down from the chair, running around, fiddling and just wiggling and chattering and chattering. i want to love every minute of her joy and her happiness and i love that we're doing something creative together that makes her happy, but i was eventually ready to scream. finally, around five, when she was calculating for the 66th time how many days it was 'til her birthday, i asked her to just keep some of her thoughts in her own head for awhile. i didn't yell, i didn't say "shut the hell up," i didn't scream, tho' i was screaming on the inside. i feel a little bit bad about it because i dearly love her and i dearly love seeing her joyful and happy. i KNOW these are the moments i should treasure as well, because in a couple of weeks, she's turning 8 and it won't be long before she's a sulky teenager, sleeping 18 hours a day. and i DO appreciate her and love her dearly. i just sometimes wish she could sit still and be quiet for just a little while. p.s. this is the first time i've tried doing a blog post from flickr. not sure i'll do it again. oh, babe, i know those days. Oh and, no parental guilt remember, it's a Code. The cards look beautiful, you talented girls! gwen--glad to hear you say that. molly--i know and normally i don't have any parental guilt. in fact, more often i have guilt that i don't have guilt, but somehow i felt a bit bad about it today. because really, how can you resent joy? Think of it this way: if your husband was sitting next to you chattering on incessantly, what would you have said to him? Now, don't you feel you behaved like an angel, in comparison? I love the new header, once again! Oh how I remember, even though my children are grown now. Sometimes I felt like every nerve was inflamed with noise overload. All I wanted was time in a padded room, so I could be in complete silence. Rarely happened, but we all survived. I send small, silent moments to you mentally and quiet little blessings, to join your sweetly noisy little blessing. Awww I hear you. Sometimes it's really hard. Especially if you have a child who's personality doesn't quite jive with yours. I was walking Florian's nephew Gabrielle yesterday and I wondered how his father manages to listen to him all the time.